Device for the automatic regulation of the operating temperature (Mold temperature, Thermal balance) of a metal permanent mold (particularly die casting mold) using a circulating heat transfer fluid. The principle of bath heating is suitable for water operation up to 90°C and oil operation up to 150°C. The construction of the unit is sketched schematically in Fig. 1 (Regloplas AG). The circulating water or heat transfer oil is in direct contact with the atmospheric oxygen. The units have bath heaters, whereby the tank (1) also functions as the expansion tank. There is a submersible pump (4), usually a centrifugal pump, on a tank (1). The cooler (3) is in the tank and is designed as a spiral shaped cooling coil which the cooling water circulates through and the heat transfer medium flows around. 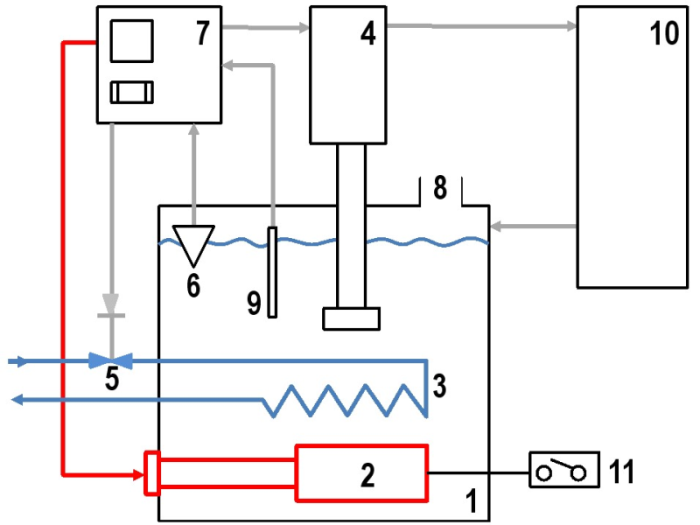 In devices with water, so-called plate heat exchangers are used instead of cooling coils. These heat exchangers have the advantage of a high cooling capacity and relatively small dimensions, although, due to their honeycomb-like structure, they are more sensitive to impurities, meaning that filters must be placed at an earlier stage in the cooling water and temperature control circuit. In devices with indirect cooling, an on/off magnetic valve (5) opens when cooling is required. Special designs may also have continuous regulation valves which, however, are technically more complex and also considerably more expensive. A temperature sensor (9) measures the temperature of the heat transfer medium and passes the value on to the regulator’s input (7). Resistance thermometers of type Pt100 or themocouples of type J (Fe-CuNi) are used as sensors. The level control consists of a float (6) in the tank which operates a switch if the level of the liquid is too low. This switch breaks the pump and heater circuit (protection against dry running). A safety thermostat (11) breaks the heater circuit when the maximum flow temperature in the heater circuit is reached. The control unit contains the control system for the automatic monitoring of the necessary elements such as push-buttons, contactors, the thermal relay for the pump rotor, etc. This also includes the temperature regulator. The regulator is a 3-point regulator with the settings heat, neutral and cool with a PID or PD/PID mechanism. Where semiconductor contactors are used, the circuit breakers or melt safety devices cut off the electricity supply when the component which they protect (e.g. the heater) is overloaded or there is a short circuit. Units with bath heaters are available at a good price and are constructed simply. For water operation, the flow temperature is restricted to 90°C due to the evaporation of the water. For oil units, the maximum recommended flow temperature is 150°C as flammable oil fumes may escape above this temperature. Furthermore, with increasing oxidation of the oil at higher flow temperatures, a strong odor is given off and there is a risk of thermal overloading of the oil due to undefined flow relationships at higher temperatures.